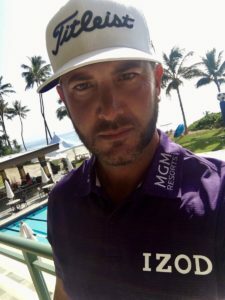 NEW YORK–(BUSINESS WIRE)–PVH Corp. [NYSE:PVH] announced today agreements in principle for multi-year marketing partnerships for its IZOD Golf brand with three-time PGA Tour winner Scott Piercy and 2015 PGA Tour champion David Lingmerth. As brand ambassadors, both Piercy and Lingmerth will wear IZOD Golf apparel on-course, making their first appearance of 2017 during this week’s Sony Open in Hawaii. Off-course, the players will contribute to future product design and development. This marks the second time IZOD has partnered with Piercy. Piercy and Lingmerth will wear the complete IZOD Golf line consisting of shirts, pants, belts and socks. They will also be featured across IZOD’s website and social media channels. All IZOD Golf apparel seen on tour will be available for consumer purchase at participating national retailers in the U.S.
Piercy was a runner-up in the 2016 U.S. Open Championship and most recently won the 2015 PGA Tour Barbasol Championship. Lingmerth broke into the top 50 in the world rankings in 2016 and most recently won the 2015 PGA Tour Memorial Tournament. © 2016 DESIGN + CREATED BY JENNICA E. MAES|ProPhoto Custom Blog Design by Northfolk & Co.